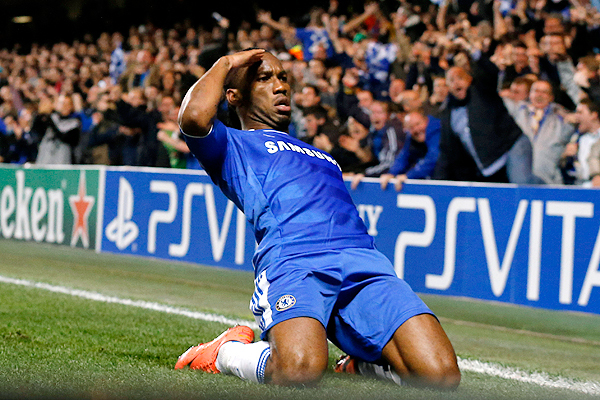 Last Season, Chelsea won the UCL after enduring a turbulent time. They finished sixth in the league, only qualifying for UCL football having won the competition. They also won the FA Cup (Drogbas winning goal) and yet, their season was not consistent. In the league, they lost at home to both Arsenal (3-5) and Newcastle (0-2) whilst in the League Cup, Liverpool knocked them out at the quarter final stage winning 0-2 at Stamford Bridge. (Anelka and Alex were let go.) They broke City’s unbeaten record, however, during a time when Drogba was largely injured, and in line with less than impressive league form, Villas-Boas was sacked, with first team assistant manager, Roberto Di Matteo taking over. It was at this season that Chelsea, undergoing a major dip in form, came back from a 3-1 first leg deficit, to beat Napoli, 4-1 in the UCL. They then beat Benefica 3-1 on aggregate (winning home and away) before defeating the mighty Barcelona 3-2 on aggregate, much to everyone’s surprise. In the final, played in Germany, they beat Bayern Munich on penalties, after Drogba scored from their only corner, despite Bayern having 20 corners (and scoring from one) over the course of 180 minutes. They did the same thing in the earlier round when they scored from their only shot on goal against Barcelona – much like Barcelona had done the last time they met. Moreover, they got vengeance for their last minute elimination when Torres scored in the last minute, away at Barcelona, to capture a draw. (Arguing over which victory was better, beating the mighty Barcelona of beating Munich at home is as vain as debating whether Greece’s victory over World Cup winners France was as amazing as their two wins over the Hosts, Portugal, during the 2004 campaign.) More bizarrely, in both games, Drogba both scored, and conceded a penalty which both opponents failed to convert, with Robben having his saved and Messi hitting the woodwork. After losing to Chelsea, Barcelona lost their home league tie, 1-2 to Mourinhos Madrid who had come a long way since their 5-0 drubbing, to record only their 2nd win in 15 attempts. It was a rare moment and further revenge for Madrid who finally showed signs of restoring the Balance of power (Barcelona had got into a habit of going away and beating a manager, who previously, had only suffered two home league defeats in almost ten years.) Guardiola, however, had met Mourinho four times prior, beating them 2-0, and drawing 0-0 in the group stage, before losing 3-1 in the UCL semifinals, and winning 1-0 at home, only to go out on aggregate. Much like the 2-6 win at Madrid in the previous season, Guardiola was establishing Barcelona as the dominant force. 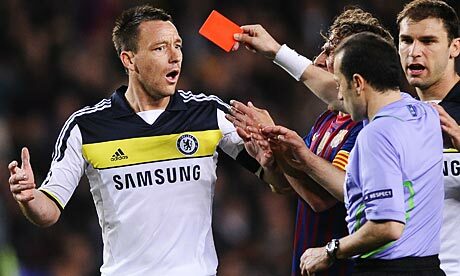 In fact, during his time, Barcelona never lost three consecutive games. Over two league seasons, they were only defeated twice, and they won two UCL cups in three years, reaching two semi finals in three. Between 2008 and 2013, when Spain won the World Cup (2010) and two European Championships (2008 and 2012), Barcelona, who have many Spanish first time internationals, took over the footballing world. In the eyes of many, they were unbeatable, producing a Brand of Football that seemed impossible to play, making them win both home and away against even the most formidable opposition. In two finals, they beat United twice, who themselves, had reached three finals in four years. Barcelona were so difficult to play against that every defeat of them was memorable, such as Inter 3-1 Barca, Chelsea 1-0 Barca, Barcelona 0-2 Rubin Kazan. Even earlier, there were signs of their European dominance when they won at both Chelsea and Milan during the 05/06 campaign (even if failing to do the double over either). It was as if defence was the only way to play against them. which meant diligently targetting and marketing four time WPOTY, Lionel Messi. Their most lethal forward trio, was when Messi, alongside Eto’o and Henry each bagged more than 30 goals in a year, and yet, even with their departures, Barcelona were still a force. Barcelona, of course, could be beaten, but it seemed to be more luck than effort. In 2008/09 campaign, Athletico came from 2-0 down to eventually win 4-3, but lost the reverse, 6-1. That season, the magnificent trio netted 105 times and Barcelona lost five times in the league. They lost at home to Osasuna (0-1) [2-3] Espanyol (1-2) [1-2], and away at Mallorca (2-1) [3-1]and Numancia (1-0) [4-1], however, as you will realise, they beat all of those teams at a Separate time. In 2009/10 Athletico beat them 2-1 but got hurt 5-2 away. In 2010/11 only Hercules (0-2) and Real Sociedad (2-1) beat them, however, they won 0-3 and 5-0 in the reverse fixtures. (That year, Mourinhos men only lost to Barcelona, Sporting Gijon, Zaragoza and Osasuna). Last year, only Madrid, Getafe and Osasuna defeated them – Madrid beat them 1-2 but only after they had won 1-3 at Madrid. It deserves emphasising how difficult Barcelona were to beat. Juventus, Porto and Arsenal all went seasons unbeaten, whilst Chelsea 04/05 only lost once, thanks to Anelkas penalty at City. Mourinho was unbeaten at home, in almost ten years, until arriving in Spain where he lost two home games in his first season. He did, in other competitions, he did lose. In UCL Porto lost twice to Madrid, and once to Panathinaikos (who they beat on away goals); at Chelsea, in the league cup, Charlton beat them on penalties and in the FA Cup Liverpool beat them, whilst his 10 men lost to Barcelona in Europe, and then at Inter, Panathinaikos beat them in the UEFA cup. Arsenals invincibles, however, also lost: “at home to Manchester United in the FA Cup, home and away defeats in a League Cup semi final against Middlesbrough, and three losses in the Champions league versus Dynamo Kyiv, Inter and Chelsea.” In context, we might better appreciate the achievements of Guardiola; in fact, as far as I can record, no team did the double over them with most UCL teams struggling to even manage 4 out of 6 points against them, with Chelsea only attaining this thanks to a last gasp strike. Ten Man Inter Milan beat the Cup Holders 3-2 on aggregate, having won the first leg 3-1 but lost the second, 1-0. Ten Man Chelsea beat the cup favourites 3-2 on aggregate, having won the first leg 1-0 and drew the second leg, 2-2, thanks to a last minute goal. In both cases, Barcelona only lost by a single goal, on aggregate, however, unlike Inter, Chelsea’s phenomenal success was made famous by the circumstances over their victory. Not only did they take 4 points from 6, they went away from home, came from two goals down, survived a penalty, and played with their captain sent off half way through before equalising, in the final minute, in a stadium 90,000 fans large. Unlike their counter parts, Milan have yet to master Milan, with their best attempt coming earlier this year. Although Barcelona have enjoyed European supremacy for the longest time, like Chelsea, Milan have played against them considerably more than other team meaning that they’ve at least had more opportunities to “acclimatise” to Barca’s style of play. Since 00/01, they have played 12 times (00/11 B 0 2 A, A 3 3 B, 04/05 A 1 0 B, B 2 1 A, 05/06 A 0 1 B, B 0 0 A, 11/12, B 2 2 A, A 2 3 B, A 0 0 B, B 3 1 A; 12/13: A 2 0 B, B 4 0 A), however, they have only recorded 3 victories to Barcelona’s 5. The Might Milan, previously epitomised by Muscle Men, was challenged by the speedy passing of Barcelona’s small team, and yet, with Bayern’s recent victories, fans of European competitiveness might be relieved by this nascent renaissance: an age when pace is counterbalanced by positional discipline which restores order to the footballing order. Unfortunately, however, having witnessed Bayern dominate Barcelona, with Guardiola arriving in the summer, it is feared that Bayern may now reign with supremacy, and become the first team to retain the cup – that is, assuming of course, they win, on May 27th. This entry was posted in Sport Talk and tagged Barcelona Beaten, Bastian schweinsteiger, Bayern Munich, Lionel Messi, Pep Guardiola, UEFA Champions League. Bookmark the permalink. Reblogged this on FathomBerry (we talk blackberry).